Flash/Web design = Interactivity ? Interactivity means that the user is able to make an immediate response to what is going on & modify the process, i.e. there is dialog between the user & the computer or communications devices. Internet, movies, television, video games, etc has made our world becoming more and more interactive everyday. The web sites and internet features, such as “pop-ups” are at many times annoying, but they are all part of our interactive lifestyle. Web page interactivity is a reference to the “dynamic” content of the site two way communication capabilities between the web site and the end user. Interactive web pages allow the user to “interact” with the page in a way that causes the page to respond to the user’s input. Interactivity can take on a number of different levels of complexity, depending on the needs of the site and the tools used to create the interactive features. Flash is powerful. Using it properly, you can create stunning visual experience and offer your visitors incredible user interaction. Although Flash is definitely not the favourite medium for usability and accessibility advocates, it has its advantages. Flash empowers the Web with functionalities which make it an incredibly interactive medium. Flash-based web-sites can look not like web-sites at all. Flash-designers tend to use colorful, dynamic, loud and extremely vibrant approaches, with effects and animation, music and videos, stunning visual elements and interactive navigation menus. Flash is unparalleled when it comes to providing users a highly rich, memorable, and interactive experience. 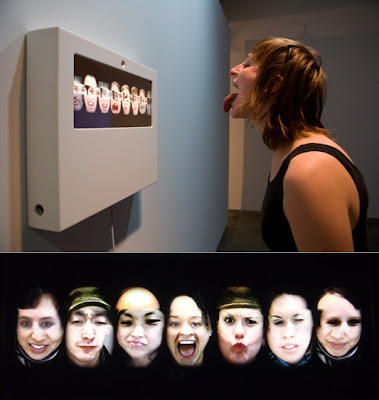 In my research, I have come across this award winning interactive installation which cuts up and recombines users faces. Reface uses face-tracking techniques to allow automatic alignment and segmentation of its participants’ faces. As a result, visitors to the project can move around freely in front of the display without worrying about lining up their face for the system’s camera. The video clips recorded by the project are “edited” by the participants’ own eye blinks. Blinking also triggers the display to advance to the next set of face combinations. 2) Children may not realize it, but every time they come home from school and run over to the television set to play video games, they are interacting! Video games have become a normal activity for young children, and adults to sit around and play. Video games are a perfect example of interactivity. The player pushes the buttons, and makes anything happen on the screen. Items such as the XBOX or Playstation 2. In the future, I think that interactivity, as well as other telecommunication trends will greatly prosper. Hopefully in postive ways, but I could see Interactivity becoming negative, through less and less communication to others. Over all, I think interactivity will positively change the world. I think it will open our minds, and show us that there are many great ways to interact, not only with other people, but with machines, and this will help us develop many more views about certain subjects. Posted on October 25, 2009, in Interactivity and tagged Interactivity. Bookmark the permalink. Leave a comment.